When infrared grills first started getting popular with outdoor chefs, they were little more than high heat searing boxes that could create a steakhouse quality crust and do little else. Over time grill manufacturers like Chef’s Grill have invested serious time and energy into developing an infrared grill that can do it all. 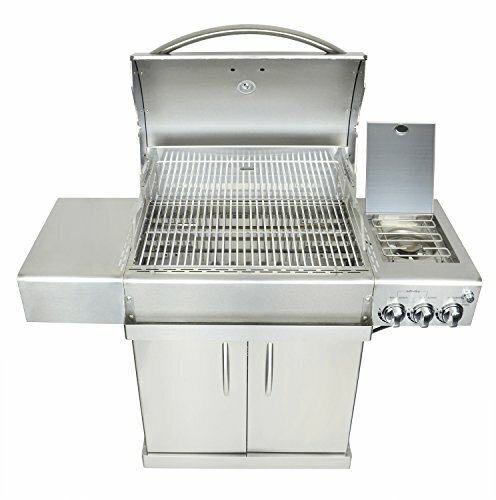 The Chef’s Grill IR2818-1 is made almost entirely out of 430 stainless steel, which gives it an appealing gleam on your deck or patio. It is set up on a sturdy cabinet base, which includes ample storage space, as well as a security ring for a 25-gallon propane tank, that meets standards established by the Underwriters Laboratories. The front also has a long shelf that can hold some simple grilling tools as well as seasoning shakers or a beverage. 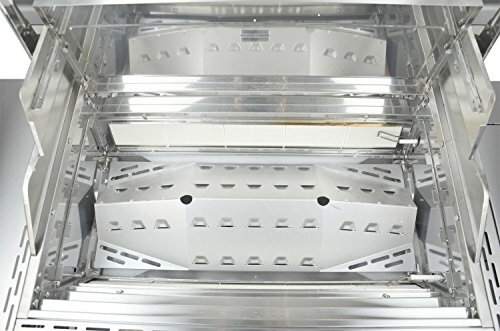 The right-hand side shelf has an integrated flip top propane burner that can produce enough heat to boil water for potatoes and corn on the cob, or even saute vegetables. It’s a nice little feature because it spares you the headache of having to run back into the kitchen to prepare hot side dishes. The two infrared burners that power the Chef’s Grill IR2818-1 are ignited by an integrated electric ignition and produce an astonishing 53,000 BTU’s of heat. 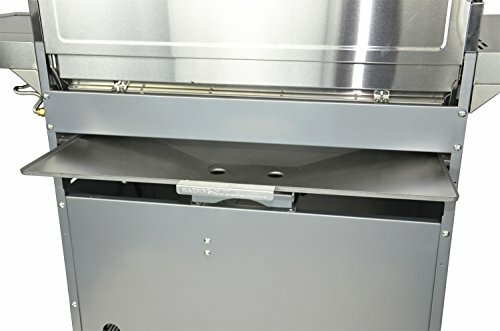 They are set up to work with heat deflectors and air diffusers to redirect the intense heat for a consistent grill space without hot and cold spots. It also has a vented good that is designed to transfer air from the front to back. This helps control the amount of smoke that reaches the food, as well as helping it to retain its natural juices and flavors. 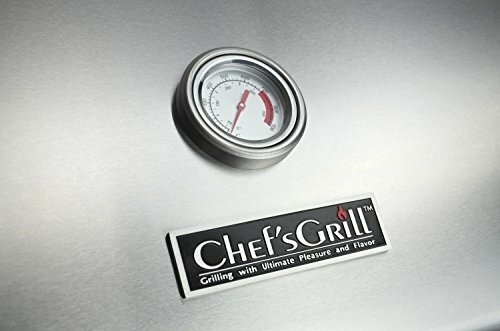 Chef’s Grill also realizes that cleanup is an important part of the grilling process. 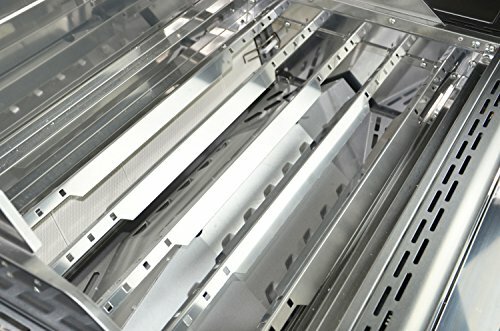 A grill that is hard to clean can be more prone to corrosion issues, and sometimes cleaning the lower recesses of a large grill can be a major headache. 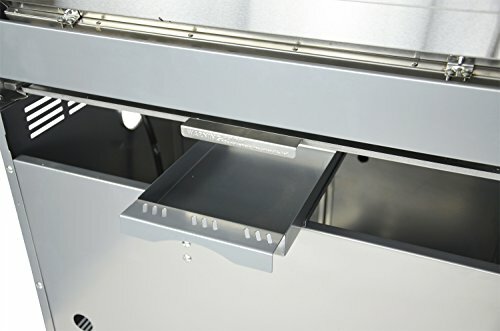 To address this the Chef’s Grill IR2818-1 has a pull-out bottom burner box, that will collect any drippings and material. It also has a slightly sloped angle that directs any liquid toward the grease drip pan located directly underneath. 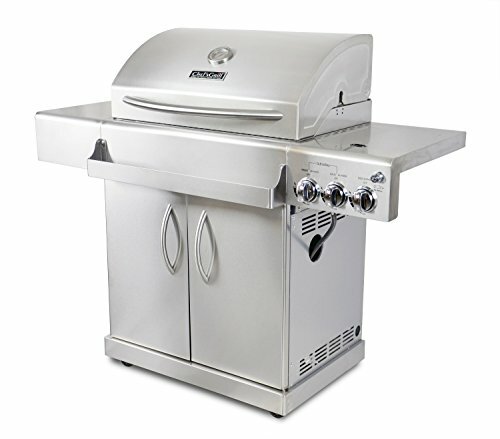 The vast majority of the Chef’s Grill IR2818-1 is made from high quality 430 stainless steel. The one place where this isn’t necessarily a good thing is with the cooking rods, where stainless steel has a nasty habit of causing food to stick. You can minimize this problem by fully preheating the grill to the desired temperature. Then lightly grease a folded-up section of clean paper towel, and lightly rub the grates right before you place the meat down. As you might imagine a propane-fueled infrared grill, with a flip top side burner, is a complicated thing to assemble. In a case like this, your imagination would be correct. If you have a modest amount of mechanical sympathy and a quality home toolbox, you should be able to put it all together in a little over three hours. 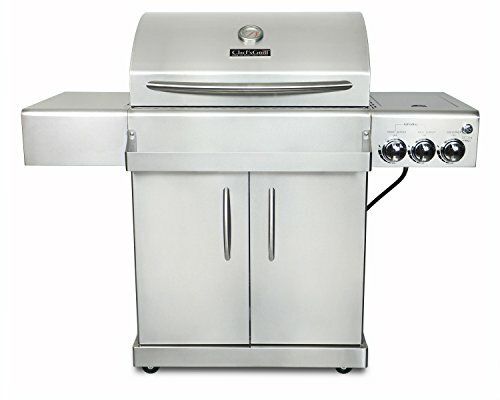 However, there are some online retailers, who offer the Chef’s Grill IR2818-1 with expert assembly. The Chef’s Grill IR2818-1’s two high powered infrared burners can generate up to 53,000 BTU’s of heat, which is spread out by heat defectors and air diffusers for maximum consistency. This means you don’t have to worry about hot and cold spots. It truly has the ability to generate the kind of high heat you need to produce a steakhouse quality sear. Yet it can also be dialed down to handle low-temperature applications, such as grilling chicken leg quarters, or even a bone-in leg of lamb. One thing to note though is that while there are a lot of cooking shows on TV that advocate improvising a large gas grill to act as a smoker, by placing foil packets of wood chips over the burner, it’s not advisable with the Chef’s Grill IR2818-1. The defectors, air diffusers and vented hood just don’t work and play well together with ambient smoke. At the same time, it is possible for aluminum foil to burn through under the radiant heat, causing a big mess! 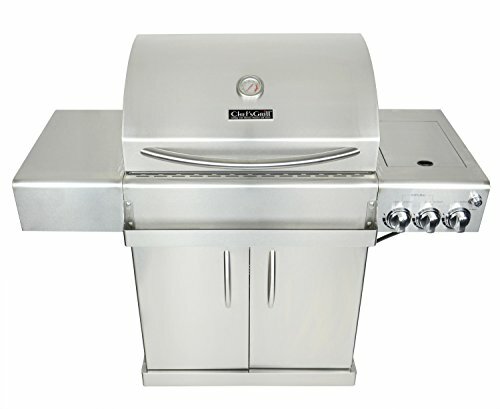 The Chef’s Grill IR2818-1 has a 672 square inch primary grilling area, along with a 168 square inch warming rack. This gives you enough room to grill for a significant number of people. Yet the warming rack is a little bit on the small side for the capacity of the primary grilling area. 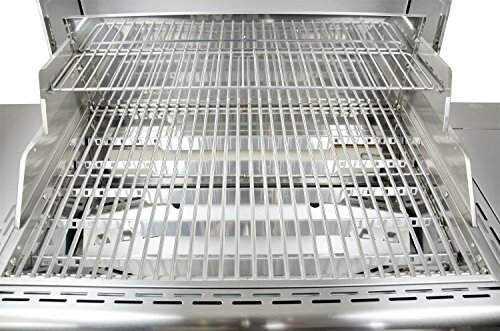 You should also keep in mind that the cooking rods of the primary grill grate are made from stainless steel. 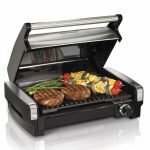 While this certainly gives them a visually appealing gleam when the grill is new, it also means you are going to be dealing with food sticking from time to time. The propane-fired side burner helps prepare side dishes. The ceramic infrared burners generate superior heat and searing ability. 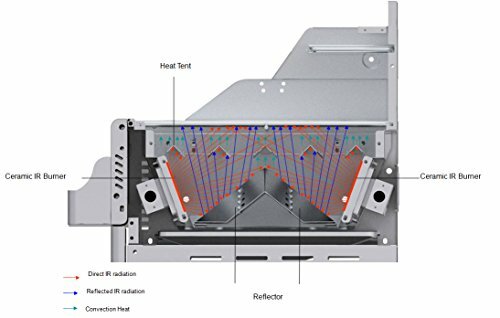 They also work in concert with heat deflectors and air diffusers to evenly distribute heat throughout the spacious primary grill area. While it might not sound like the sexiest feature in the world, one area where the Chef’s Grill IR2818-1 shines, is with it’s easy to clean. The bottom burner box pulls out, allowing you to wipe it away from the back, without having to reach down into the box or mess around with the elements. The bottom burner box is also contoured to help funnel any excess marinade or other drippings into the pull-out grease drip pan. The only knock on this two-part system is that it can only be accessed from the back. Which means you can’t lay the grill out with it’s back to a wall or railing. 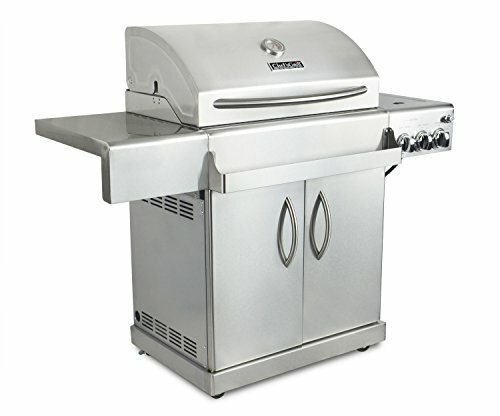 Chef’s Grill IR2818-1 comes with a one-year warranty the date of sale against defects in material or workmanship. 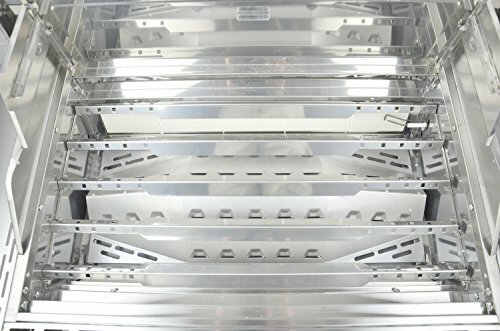 The burners also come with a five-year warranty where any stainless steel burner that rusts through or burns through will be replaced free of charge. We are at a time where infrared grills are evolving out of their infancy to provide backyard chefs with a superior grilling experience. Chef’s Grill steps into this arena proudly with their IR2818-1. 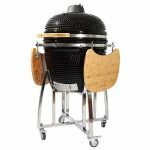 It has the ability to handle just about any grilling application and has the superior grill space to cook for a large number of people. Just keep in mind that it doesn’t do a good job as an improvised smoker, and you will need to prepare the stainless steel grill grates with a light coating of oil before placing the meat, or you will end up with some serious sticking problems. Limited 5 year burner warranty ensures a grilling experience you can depend on.